Dennis P, Carol C, and Myself met at the Nineteen Mile Brook Trailhead. We spotted a car there and traveled to the Glen Ellis Falls trailhead, one half mile south of Pinkham Notch. There is a parking area on the west side of Rt 16. The trail starts through an under pass of the highway then rock skips over the Ellis River. This would be a problem in high water, but there is an option to start at Pinkham and take the Lost Pond trail to the Wildcat Ridge trail, an additional distance of about .7 miles. 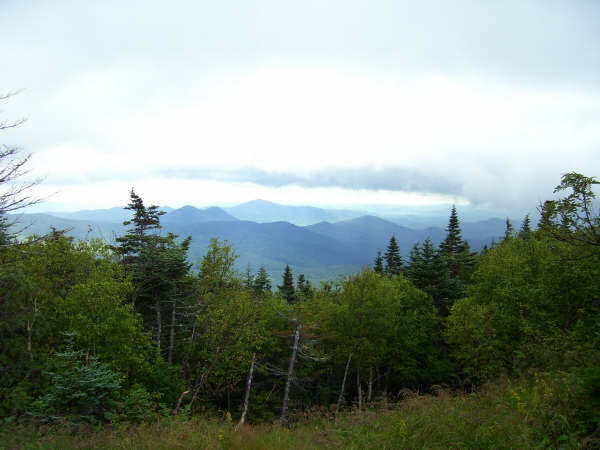 The Wildcat ridge consists of 5 summits, labeled A through E with many smaller summits along the way. Only two peaks, A and D, are counted as 4000 footers. For several years, E was considered a 4000'er but a resurvey has placed D in its place. The trip up Wildcat E from Rt 16 is very steep right from the start, with pinned steps on bare rock. We had a cool windy start which was very welcome as this climb up E is very aerobic. 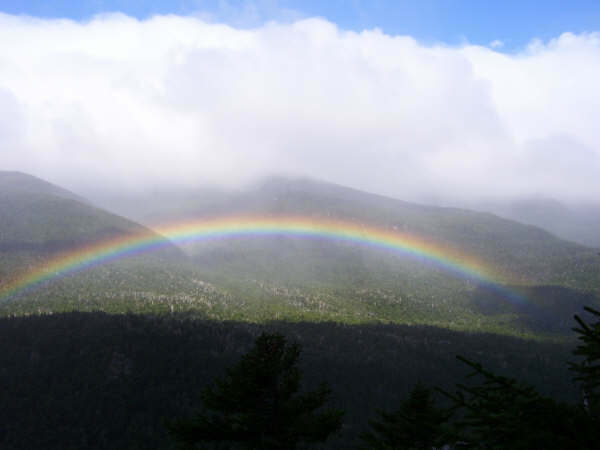 We were also greeted by a spectacular rainbow covering the valley below us on Rt.16. When we reached the look outs we stopped to catch our breath and enjoy it. The Wildcat Ski Area is located on the west side of the mountain, the lifts topping out between D and E. Most people will bypass the steep Wildcat Ridge section up E in favor of going up the Polecat ski trail. The observation tower there was roped off which based on the cloud cover was not a problem for us. The Majority of the ridgeline was in the trees, so the gusty winds were never a real problem. We were down and on our way home by 3:30, a brisk pace for this 8.5 mile journey.